It is convenient to begin with the largest diamonds found as cut-glass motifs and work on down to those of smallest size. 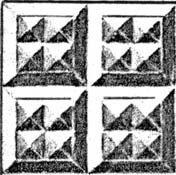 All of these four-sided figures are produced by two intersecting sets of parallel miter cuts, with one exception, the quarter-diamond motif. 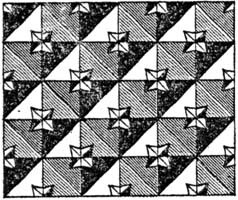 (This motif, discussed at the end of this file, uses four intersecting sets of parallel miter cuts.) 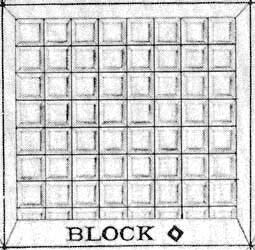 If the individual miters in each set are spaced far enough apart, a field of open diamonds (blocks) will be produced that have an “open,” or uncut, face. J. Hoare and some other manufacturers called the motif/pattern block diamond (right). Because of its profile, this motif is sometimes referred to as a table diamond. Occasionally the open face is cut with a single star (below, left), resulting in the starred-diamond (or starred-block) motif (Davis 1964, p. 95). The drawing shows stars with four points; eight points are more commonly observed (note 1). The spacing between the individual miter cuts can be reduced until the open-face diamond becomes a point, and the diamond is said to be closed. A number of terms have been used to describe this motif, including sharp diamonds,nail-head diamonds (note 2), relief diamonds, and raised diamonds (note 3) (below, left). A further reduction in the spacing between the miter cuts results in the smallest diamonds, called fine diamonds (below, center) (Image: Internet), a term that is synonymous to strawberry diamonds when the latter is used to describe a motif, not a pattern. Fine diamonds are sometimes used on the uncut face of an open diamond, producing the motif called English strawberry diamonds (below, right) (Davis 1964, p. 95). 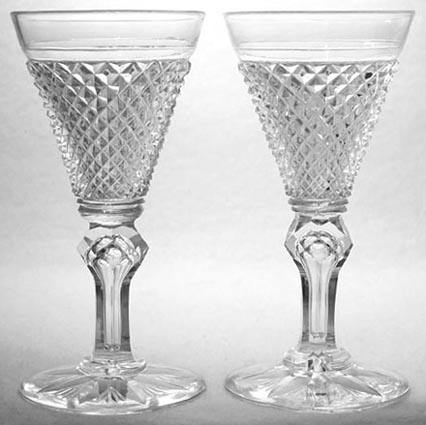 A pair of sherry glasses cut with sharp diamonds. Facetted inverse-baluster stems with air traps. (Note the increase in the thickness of the glass as the base of the trumpet-shaped bowl is approached.) H = 4.5″ (11.4 cm), rim D = 2.1″ (5.3 cm). Attrributed to C. Dorflinger, c1875. This pair of glasses sold at auction for $102 in 2002 (Image: Internet). 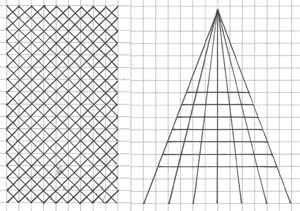 It is possible to cut two intersecting sets of parallel miter cuts with their depths so shallow that sharp diamonds are not produced; the area is merely “roughened.” The resulting motif is called crosshatch (below, left). It is not always possible to tell the difference between crosshatch and fine diamonds, especially on photographs. 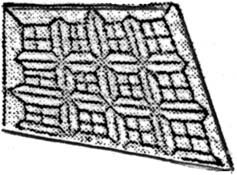 The term “crosshatch” has also been used where one set of the two sets of intersecting miter cuts contains miter cuts that converge (are not parallel), and where the cuttings are also shallow (below, right) (Pearson 1965 p. 30). A better term would be cross-cut fan. Libbey used this motif in several patterns; it is especially prominent in the Melrose pattern (c1906). Although both statements refer to the same motif, known as cross-cut diamonds, they describe two different versions of it. The first quotation refers to sharp diamonds that have been overcut with tiny Xs that are positioned exactly on the apexes of the sharp diamonds, as illustrated by the drawing on the left (Davis 1964, p. 95, re-drawn from Westropp). As the statement indicates, this motif was in use during the nineteenth century, although it was actually derived from the “cross-cuts” sometimes found on the large, shallow diamonds that were slice-cut during the latter half of the previous century. On the nineteenth century cross-cut diamonds the cutter had to be capable of great accuracy. Each cross-cut diamond had to be cut precisely; there was no room for error. Additionally, too much pressure on the part of the cutter and the sharp diamond’s point could shatter. Few American examples of this version of the cross-cut diamond exist. An early example is shown in Palmer (1993, p. 115) on an American-made tumbler engraved with the date 1844. The British call this type of cross-cut diamond a “laced diamond” (Wilkinson 1968, p. 37). The second quotation refers to the “garden variety” version of the cross-cut diamond that one sees so often. It was cut in abundance during the American brilliant period, both as a motif and as the Strawberry Diamond pattern. As illustrated on the right (Pearson 1965, p. 30) the sharp diamond of the previous example has been replaced by a small open diamond that is cross-cut with an “X” that subdivides it into four smaller diamonds (note 4). In this case there is room for error. Examine any piece of cut glass that contains the cross-cut diamond motif, including pieces cut in the Strawberry Diamond pattern, and one is all-too-likely to find cross-cuts that are off-center. Some cuts are so far off-center that they miss the open diamonds entirely! One can readily believe that these examples were cut by a cutter “with his eyes closed and one hand under his head.” This version of the cross-cut diamond motif — accurately cut, of course! — appears on Waterford (Ireland) cut glass as early as c1830 (Warren 1981, pp. 43-51). The Strawberry Diamond and Fan pattern cut on shape no. 1400 by Mt. Washington, probably before 1895. It contains both versions of the cross-cut diamond. Although the “laced diamonds” of the first version occupy most of the tray’s surface, the miter cuts that form the diamonds that are near the tray’s edge are less deeply cut. This results in flat-topped diamonds which, when overcut with Xs, produce cross-cut diamonds of the second version. L = 13.5″ (34.3 cm), W = 8.5″ (21.6 cm), H = 1.5″ (3.8 cm). Sold at auction for $143 in 1998; several small basal chips are present, the largest of which can be seen at the 9 o’clock position. This tray is a good example of the excellent accuracy-in-cutting that was achieved at this time. It also demonstrates the high degree of brilliance that results when closely-spaced miter cutting is combined with colorless glass metal of great purity. A similar example in Swan (1986, p. 92) was probably made by C. Dorflinger & Sons. If the cross-cuts on an open diamond (or block) are deeply cut, they divide the diamond into four, small sharp diamonds. 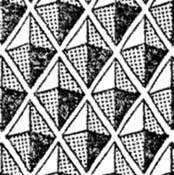 The resulting motif of checkered (chequered) diamonds is illustrated on the left by a drawing taken from a classic book on Irish glass by the museum curator M. S. Dudley Westropp (1978, p. 166). American writers have sometimes co-opted this term, using it incorrectly as a synonym for cross-cut diamonds. The true checkered diamond is seldom found on American cut glass. 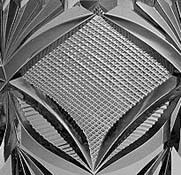 A double-checkered diamond can also be found on American glass (See the oconnor7.html file in Part 2 for an example.). The last diamond motif to be discussed in this file is the quarter-diamond motif/pattern illustrated on the right. Simple open diamonds are “quartered,” that is, two additional intersecting sets of parallel miter cuts divide the open diamonds into quarter-sections. Because these additional miter cuts are cut on the diagonals of the open diamonds, the resulting “quarters” are actually triangles. 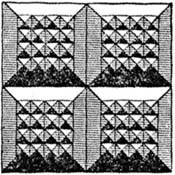 The motif is almost identical to, and therefore sometimes confused with, the pyramidal-triangle motif. The quarter-diamond motif uses four intersecting sets of parallel miter cuts (pyramidal diamonds use three sets). In this respect the quarter-diamond motif differs from the other diamond motifs in this file that use only two intersecting sets of parallel miter cuts. An actual example of the Quarter Diamond pattern is shown on the champagene jug on the left, an image reproduced from a photographic catalog of C. Dorflinger & Sons (c1888) that was reprinted by the ACGA in 1997. 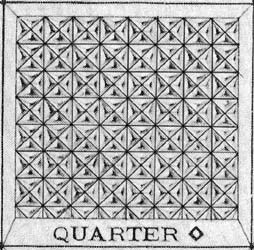 Because the Quarter Diamond pattern was cut by other manufacturers as well, the pattern is considered generic. It has, like the starred-diamond motif, also been confused with the Hobnail pattern. 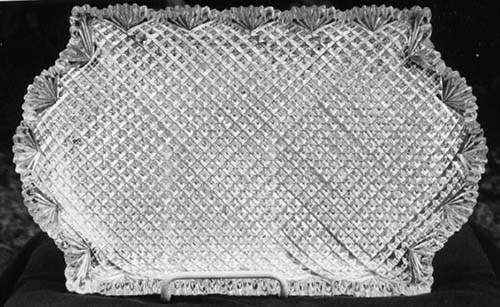 As mentioned in the hobnail file, a famous item at the Corning Museum of Glass — a centerpiece in the form of a canoe cut by J. Hoare & Company — has, for more than thirty years, been incorrectly described as an example of the Hobnail pattern. Its pattern is actually Quarter Diamond. 1. The starred-block motif is sometimes erroneously called “hob-nail cutting,” especially in Great Britain (Elville 1953, p. 30; Elville 1967, p. 70; Davis 1964, p. 95; Newman 1977, p. 151). Although his definition is incorrect, the cited British writer Harold Newman both illustrates and labels “hob-nail cutting” correctly on p. 85 of his dictionary. 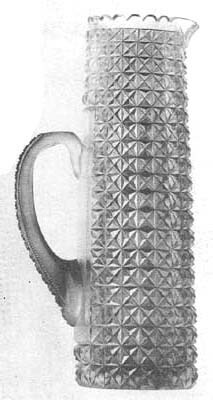 The hobnail motif has also been confused with cross-cut diamonds, an error pointed out by Westropp (1978, p. 166) as early as 1920. (N. B.: A hobnail is formed by three or four intersecting sets of parallel miter cuts, depending upon whether the hobnail produced is hexagonal or octagonal. Two intersecting sets of parallel miter cuts create the various diamonds described in this file; they can never produce hobnails.) Additionally, regular (i.e., two-miter) cane has also been confused with the hobnail motif. In this case an octagonal hobnail is included in the motif, but it is only part of the entire motif. 2. Carpenters’ nails during the early nineteenth century were not flat-topped. Their heads were pyramidal and, as a result, they came to a point. 3. 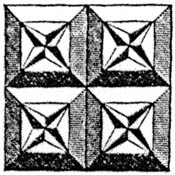 The Pairpoint Corporation used this motif in a pattern called Raise (sic) Diamond. 4. Possibly the earliest example of this variety of the cross-cut diamond motif appears on a vase supposedly made in 1824 or 1825 by Bakewell of Pittsburgh, PA for the Marquis de Lafayette. As described by Innes (1976, pp. 114, 118) the vase’s provenance is not iron-clad, however. Nevertheless, the vase’s unusual foot matches one used on an English rummer that was made about 1825 (Wakefield 1982, p. 82).